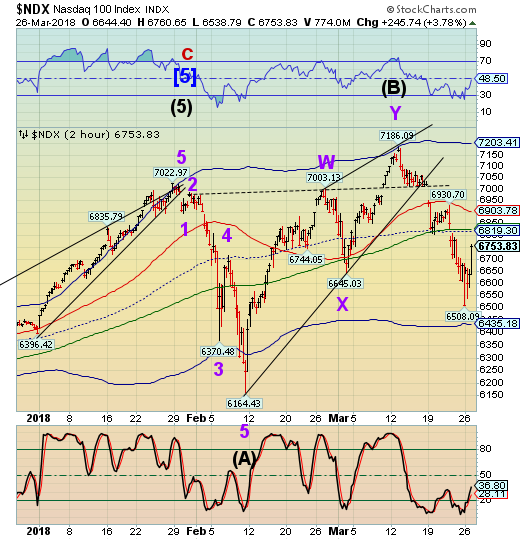 Are Stocks Ready for a Profound Failure? NDX futures overshot the double resistance levels at the mid-Cycle (6819.30) and the 50-day at 6826.78. However, it has pulled back beneath the 50-day at this juncture. 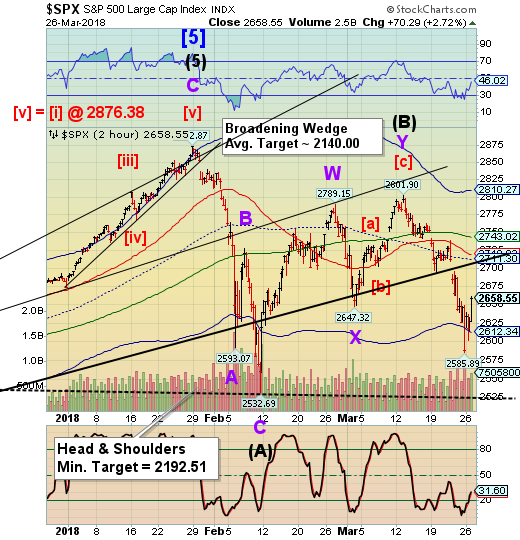 It bears watching, since it may lead the SPX in a reversal. Whiole stocks were going higher yesterday, the NYSE Hi-Lo stalled at the 50-day Moving Average and has receded the rest of the day. This action does not bode well for the strength of the equities market. 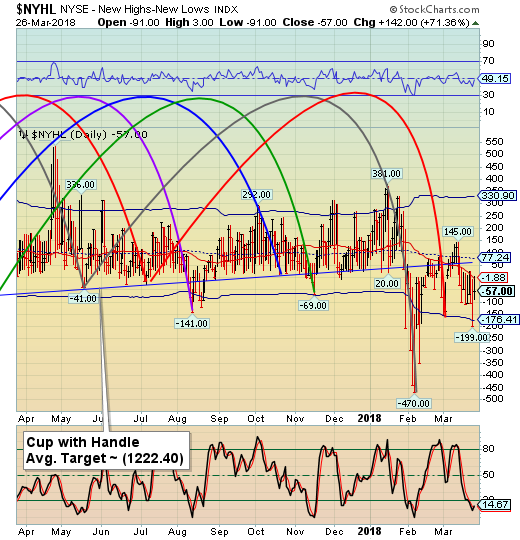 It rmains solidly on a sell signa. VIX futures are on the decline this morning, but within the parameters of a retracement. 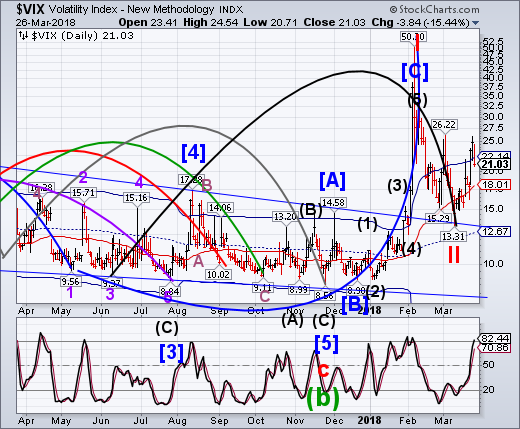 The 50-day Moving Average at 18.01 plays an important role of keeping the VIX on a buy signal. Equities haven’t bottomed just yet. Some commentators have been swift to say Monday’s U.S. stock bounce shows the bull market is firmly back on track. But, as Aristotle once observed, "one swallow does not a summer make, nor one fine day." 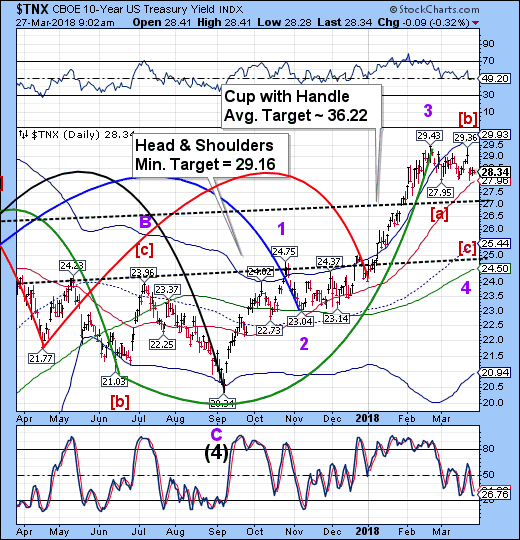 TNX may be ready to descend beneath the Intermediate-term support at 27.90 as the decline may be ready to ‘lock in.” As if the last commitment of traders report, the speculators are still heavily short the 10-year. Last week’s low at 27.99 did not break down beneath the prior low at 27.95. When the breakdown occurs, there will be a rush to cover their shorts. USD futures are bouncing after testing Cycle Bottom support at 88.57. 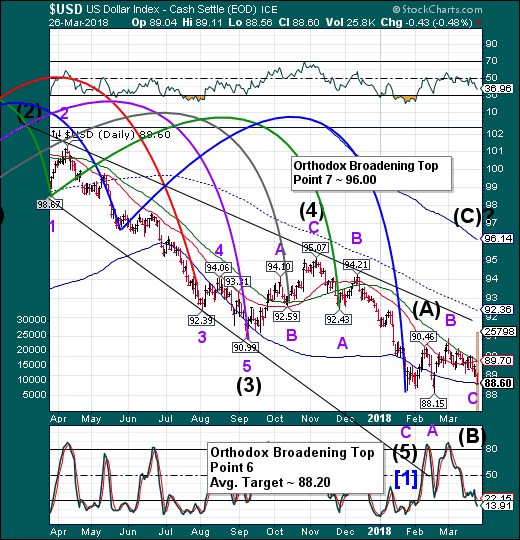 USD shorts will also have to cover as the dollar vaults toward Point 7 at 96.00. The Cycles Model suggests the rally may last about a week, but it will appear to be vicious for the shorts.